Jacquie Russell is a former Co-Director of a Construction Project management company and is now a Property Developer. Previously she has been Leader of East Grinstead Town Council and Chairmen of its Planning Committee. She is a mother of five, grandmother of two, and enjoys walking and photography. 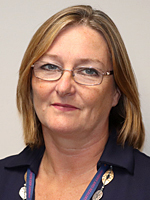 Jacquie is an Adviser to the Cabinet Member for Highways and Infrastructure advising on highways.